Home > A FREE can of Chem-Dry Spot Remover with our Gold Service! A FREE can of Chem-Dry Spot Remover with our Gold Service! We understand that little accidents are inevitable but that doesn’t mean your carpets have to suffer. The trick to dealing with spills is to act fast with an effective carpet cleaner. Our World Famous Chem-Dry Spot Remover is perfect for the job and works to remove your light carpet stains. Our special formula has been developed to make it strong enough to give your carpets a good clean, whilst being totally animal and pet friendly. Best of all, book for your Carpets to be Cleaned and Protected on our Gold Service and we will include a huge, 20oz can FREE as our gift to you! Our spot remover is world famous for good reason. But don’t just take our word for it! Here are some genuine reviews from other customers in the area. 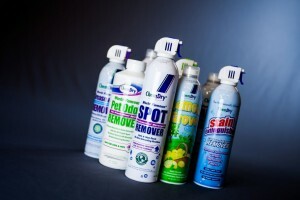 Check out what they have to say about using our World Famous Chem-Dry Spot Remover. I received my can of of the World Famous Spot Remover and it’s been given a good testing this weekend. It’s cleaned up after a poorly child, including some very sticky, well trod in medicine; some paint after a very enthusiastic art session and lots and lots of old ‘spots’. It’s worked a treat. Much easier to use than my usual carpet cleaner and much, much more effective. I will definitely be coming back for more. Thank you. The World Famous Spot Remover works a treat, somebody (remaining unnamed, Scott) left stains on the landing in our office. Not sure what they were but dark and oily. Spot remover worked a treat thanks! If you are considering this don’t hesitate and P.S. they have cleaned carpets for us before, like new….need I say more!